JNVST 2019 9th Class Results: Navodaya 9th Class Entrance Test 2019 Results. Navodaya Vidyalaya JNV Class 9 entrance exam result declared: Jawahar Navodaya Vidyalaya (JNV) has released the selection list of students for admission to Class 9 through Lateral entry Test. The JNV entrance examination for Class 9 was conducted on February 2, 2019. Candidates can check the results on the official website of JNV. 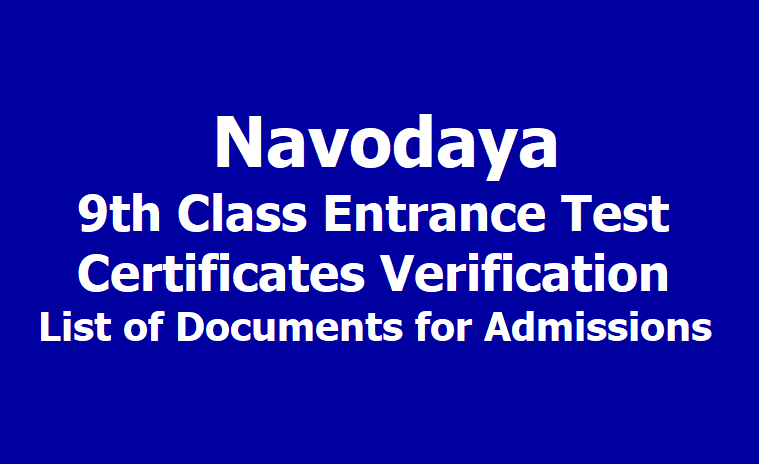 The Navodaya Vidayala Samiti ( An Autonomous Body Under MHRD ) under the Government Of India has issued a provisional select list of Class IX Lateral entry selection Test 2019. All the candidates who appeared for the test can check their results on the official website of Navodaya Vidyala Samiti- navodaya.gov.in. Candidates can check the Navodaya Vidayala Samiti provional select list of Class IX Lateral entry selection Test 2019 from the direct download link given below. Candidates can check their results using their roll number, father’s name and their date of birth respectively. The list contains the name of students selected across 36 different states for Class IX Lateral entry selection Test 2019. The list issued contains the name of the candidates selected for different states and the respective districts. The list also contains the Jawahar Navodaya Vidyalas (JNV) where the admission of the selected candidate is considered. Parents/ Guardians of the students selected in the list will have to submit a duly filled form to the principal of the schools. Certificates from the competent authority in respect of Rural, OBC, SC, ST and Disability as applicable are to be submitted to the JNV for verification of documents / eligibility to confirm admission to Class IX After verification, JNVs will confirm the admission, if the candidate is found eligible as per NVS norms. “Parents are advised not to take TC from the previous school until the admission is confirmed by the JNV. Admission to JNVs is done free of cost. No fee is to be paid to school authority for admission to Class- IX. The parents/students are required to approach directly the Principal of the JNV concerned,” an official notice reads. Step 2. Filled in formats are to be submitted to the Principal of JNV concerned as per schedule. Step 3. Certificates from the competent authority in respect of Rural, OBC, SC, ST and Disability as applicable are to be submitted to the JNV for verification of documents / eligibility to confirm admission to Class IX After verification, JNVs will confirm the admission, if the candidate is found eligible as per NVS norms. JNVS has informed that admission will be given to the selected candidates only after due verification of the documents. Parents are advised not to take TC from the previous school until the admission is confirmed by the JNV. Admission to JNVs is done free of cost. No fee is to be paid to school authority for admission to Class- IX. The parents/students are required to approach directly the Principal of the JNV concerned. Select list of students for admission to Class IX through Lateral Entry Test against vacant seats has been released. The activities may be taken up by the parents/guardians after selection of students for admission to Jawahar Navodaya Vidyalaya.